Today's the last day to save at Kitchen Sink Stamps after Christmas Sale! You'll SAVE 20%on everything in the Kitchen Sink Stamps store when you use code LISA20KSS (sale ends today, December 28th, midnight EST). If you happen to be reading this at a later date, you can always use code LISA10KSS to save 10% on all your purchases at Kitchen Sink Stamps. Have you entered this months Kitchen Sinks Stamps challenge? Hurry, you only have until December 31st to enter! There's been some great entries again this month. What are you waiting for? Get out your Kitchen Sink Stamps and play along! *Note only entries using 100% Kitchen Sink Stamps are eligible for the random prize drawings! Have a great week! Don't forget, starting Wed., Dec. 30th - Midnight EST., Kitchen Sink Stamps, Inc. (webstore) will be "under construction" for a brief period while undergoing a fabulous Kitchen remodel for the New Year! Your favorite KSS bookmarks should still work just fine for this period of down time ! Stamp image from Multi Step Kittens & Pup as follows: #4 Memento Black, #3 Memento Rich Cocoa, stamp, ink and repeat, #2 Memento Rich Cocoa stamp off, ink and repeat, #1 Memento Desert Sand, stamp off, ink and repeat. I was just looking at this set the other day, thinking I need to ink it up! Thanks for the awesome inspiration!!! And thank you for including your color recipes! It helps tremendously! What a great job you have done with this adorable pup!! Love the layout and the wonderful use of designer paper!! 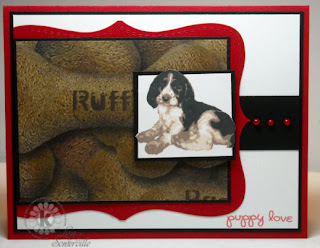 Another sensational card, Lisa!! Thanks for inspiration!! I'm going paper shopping today!! Just so cute, love the way he pops out of the box! Lisa - What a sweet pup! Love the designer paper you used!! Oh this is just too cute, Lisa!! That DP you used is just perfect!! Your card is adorable, which reminds me, I need to spend some serious time stamping. Love what you've done. How stinkin cute. Love this little puppy. Great job with the sketch, thanks for playing along--as usual.